The Long House cliff dwellings are located on the Wetherill Mesa in Mesa Verde National Park. The site is one of the larger cliff dwellings in Mesa Verde. Other than on the guided tour the only place where you can get a view of the Long House site is from the overlook on the tram road. The times and frequency of the guided tours vary throughout the year so it is best to visit the Mesa Verde website and plan your visit ahead of time. Long House and Wetherill Mesa are only open from Memorial Day to Labor Day. Since the size of the tours are limited you might also consider buying tickets in advance for the sites you are interested in. Other popular tours at Mesa Verde include the Cliff Palace and the Balcony House. The Spruce Tree House and the Step House are other cliff dwellings that you can visit without purchasing a ticket or participating in a guided tour. 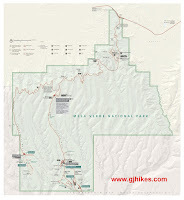 Tour tickets are obtained from the Far View Visitor Center at Mesa Verde and also from the Visitor Center in Cortez, Colorado. Tickets can be purchased up to 2 days in advance. Once you have your tour tickets in hand follow your map to the Balcony House parking area. Keep in mind that if you are driving from Cortez that the Far View Visitor Center is about 14 miles inside of the park once you turn off of Highway 160. It is about another 12 miles of winding road from there to the parking area on Wetherill Mesa. The speed limits within the park never exceed 45 MPH but if you plan on averaging 25-30 MPH you will come out about right. Once you reach the parking area on Wetherill Mesa there is free tram that is available on a first come basis to take you to the Long House trailhead and a few other sites. There are around 150 wild horses in Mesa Verde that have migrated up from the Ute Mountain Ute Tribal Park to the south. The horses can be spotted most any day in the park on Wetherill Mesa and near the Visitor Center. It is also common to see deer in the early morning and evening hours along with the occasional black bear. The park rangers serve as guides on the tours. They always begin with a few instructions to keep everyone safe and to give them an idea of what to expect. This particular guide was a Native American named Clyde that added a special flare to the experience. All of the guides seemed very skilled and capable of helping visitors make the most of the experience. The trail to the ruins begins descending at a gentle slope on a wide easy path. The Long House cliff dwellings are about 150 feet lower than the trailhead. A good part of the descent is accomplished by several stages of well built stairs. At the base of the last set of stairs the remainder of the trail is laid out beginning with a set of about 4 switchbacks that changes back into a gentle sloping path. The park rangers guiding the tours can almost bring the ruins to life with the information they share from what has been learned from studying these ruins and others and from interviews with some of the descendants of the Ancestral Puebloan people that once lived here. There are 2 ladders that take visitors up into the upper part of the ruins. The ladders are very sturdy and well secured. The top runners of the ladders are extended enough to make the transition from the ladder to the rock natural and easy. Once at the top the tour continues by exploring the back of the alcove and the top most rooms. One particular interesting aspect of the Long House site are these holes that had been hewn into the rock to catch water from the seep that is at the back of the alcove. If you look closely you can see a shallow groove cut into the rock to direct the water. Small clay vessels were found in Mesa Verde that would fit nicely inside of the holes. There are some faint pictographs or rock art on the cliff behind the dwellings. The tour progresses through the top of the ruins to several kivas on the opposite end and then exits first by descending a small 4 rung ladder that is followed by a series of steps leading back down to the courtyard in front of the ruins. From that point the tour retraces its steps back up the trail to the tram stop. The hike back up the hill is probably the toughest part for some of the visitors. Depending on their personal fitness it probably ranges from moderate to strenuous. Since it is a relatively short distance everyone should be able to make it with only 1 or 2 rests. There is a limited amount of time to get to the top of the hill to catch the tram but unless it is the last tour of the day there will be another tram coming along within the hour. There is also the option to either take the tram in the other direction and visit the overlooks before returning to the trailhead or simply walking back along the trail to the parking area which is about 1/2 mile. The tram safely whisks visitors back to the parking area on Wetherill Mesa. There are several other sites on Wetherill Mesa that you might consider visiting. The Step House ruins are about 1/2 mile east of the parking area. The trailhead is next to the spot where the tram is parked. There is another trailhead for the Badger House and Nordenskiold trails that is located near the southeast corner of the pavilion. There is also the option to take the free tram on its regular route to the Badger House and several overlooks or to hike to the Badger House and Nordenskiold ruins and take the tram back. A concession stand in the far end of the pavilion sells a few snacks and drinks as well as some camera supplies. The National Park Service has a pretty good setup on Wetherill Mesa and the Long House cliff dwellings are a perfect reason to pay them a visit. If you would like to see it for yourself then all you have to do is 'Take a hike'.